Media Hub - Play Festival 2014 - Review. We’re back home, the tent is still soggy, my body still aches a bit and despite two nights in a real bed I still feel like I need more sleep. The post-Play aches and the struggle to return to the real world are all dwarfed by the mind, body and soul enriching experience that is Play Festival. 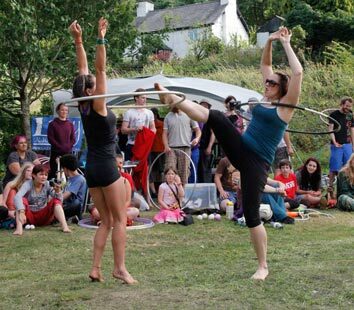 For those that don’t know, Play is a spinning, juggling, manipulation and acrobatic festival situated just inside the Welsh border at the Llanfyllin Workhouse. The venue has an ideal combination of indoor space, spacious grounds and beautiful surroundings. The site is overlooked by the Lonely Tree, which after being felled in the February storms is, hopefully, phoenixing into a new tree. The five days of Play are filled with workshops in every discipline around. 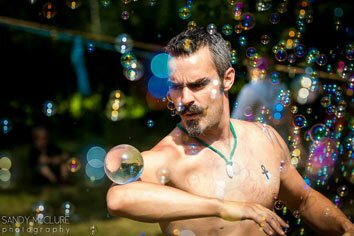 Highlights of the immense workshop timetable include an entire slackline area with experienced instructors on hand all day, many staff workshops from legends like MCP, Simon “Turtle” Janson and Christian Unger. 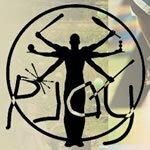 Poi workshops with Exuro, Tom Grinyer, Morten Kjaer, Danielle Good and Christian Unger, hoop instruction from Just Add Hoops and Kyle Johnson. There’s also contact juggling, toss juggling (balls and clubs), trapeze, aerial silks, rope and hoop, Chinese pole, hand-to-hand, handstands, capoeira, diabolo, dance, stilts, character, choreography, balloon modelling and even a hug workshop. Not only do events like Play nurture and develop a community but they are extremely important for the development of the circus and manipulation arts they cater for. The extensive workshop timetable is an effective way for skills and techniques to be communicated and taught. These ideas and skills cross geographical boundaries; we had teachers from USA, Australia, Germany, New Zealand, France as well as from all corners of the UK. 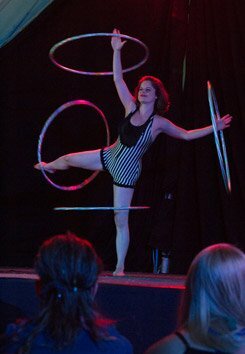 They also cross “boundaries” between the different props, for example, acrobatics is filtering into staff manipulation, contact ideas are spreading into club juggling and poi, and hoopers and poi spinners are increasingly juggling their props. It’s also fantastic to see more of the prop-less arts like tumbling, martial arts tricking and capoeira starting to appear at Play. 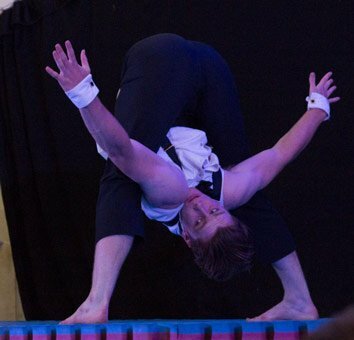 This year it was in a big part thanks to the members of the Commonwealth Youth Circus (more about them later) though there were several others with skills in these areas, including Will Thorburn who taught capoeira every day. No juggling/spinning event is complete without the games. Saturday afternoon featured fun games like people surfing, hoop gladiators and balloon dog death as well as some more serious and esteemed games like five club and handstand endurance. Even the Welsh weather seems to appreciate the games with one of the few rain showers conveniently occurring just after the games finished. There is also a plethora of music at Play with DJs in the Spinning@ tent providing daytime beats to spin to and the odd acoustic act to complement the glorious Welsh sunshine. There was also music in the evenings with the DJs getting louder and increasing the tempo. There is usually a band or two on in the evenings at Play, however, due to some unfortunate events out of Play’s control we only had one band this year and they didn’t have as many members as originally planned. Then there are the shows… oh my gosh, the shows. Play never fails to attract some of the best home-grown and international acts to perform. Somehow, a whole extra show was squeezed into the timetable for 2014. The Opening Show, which followed the welcome meeting on Wednesday evening, was by Lost in Translation Circus (LIT). LIT, a Norfolk-based group, showcased a reduced version of their show, The Hogwallops. The show was full of eccentric characters that formed some kind of oddball family. Opening with members of the Hogwallops teasing one of their number with a single juggling ball and cardboard box in a well-choreographed piece, the unfortunate family member eventually gets his hands on the ball and proceeds to entertain us with an excellent ball juggling routine. Other highlights of this show included some great acrobatics, a three-high acrobalance and an aerial routine using a Zimmer frame hung to an aerial rig. I loved the creative thinking in the use of a mobility aid to perform aerial acrobatics feats and I would love to see how this sequence in particular fits into the full show. LIT will be touring The Hogwallops in 2014/2015 so hopefully we’ll all get the chance to see it in full. Next up in the show schedule was the Open Stage. The Open Stage provides a platform for new and emerging acts and performers to air their routines. Given the talent of Play attendees the Open Stage can rival the Galas. Will Thorburn opened proceedings with a capoeira demonstration. He was followed by Morten Kjaer’s second appearance on a Play stage, once again delighting us with cutting edge contact poi including some exquisite double fishtail patterns. Tom Grinyer performed a club manipulation and juggling routine which featured many tricks he’d learned just weeks earlier at the EJC, including a sweet balance trick at the beginning which he totally nailed. MCP continued the almost unbroken tradition of performing at every Play since its inaugural event in 2005. Like some of his recent Play appearances the act was weird, funny, technical and poignant. A musical act was next with Jim on the guitar. Jim’s “finger style” playing is something else. He played a rendition of Eye of the Tiger with all the parts of that song reproduced on a single guitar. Feet Off the Ground returned to Play with some intriguing contact dance before Hooping Idol, Hannah Flett (or is that Emma Fletch? ), knocked our socks off with an awesome hoop routine that finished with a four hoop split. Hannah is one to watch; with the combination of excellent stage presence, great movement and difficult tricks, expect to see her on even bigger stages. The penultimate act was from The Obligatory Acro Act (aka Emily and Joe) who, dressed in some eye-flinchingly loud ‘80s attire, rocked out some impressive acrobalance moves to “I Just Died in Your Arms Tonight” by the Cutting Crew. Headlining the Open Stage was Will Borrell with a club swinging, manipulation and juggling act. Will’s routine is a breath of fresh air for acts of this type. Often club juggling and manipulation acts are serious, “French-style” affairs whereas Will’s act is full of joy and fun; “happy clubs”, as someone said after the show. Not only that but Will’s skills rival any "French" counterpart – his double fishtail patterns are as smooth as butter and his five club finish was the perfect climax to the show. Friday featured a matinee show. Last year we were treated to Shake That, a totally amazing bar flair/physical theatre show. This was probably the best thing ever to appear at Play but also one of Shake That's last performances as a group. A hard act to follow but, appropriately, this year’s matinee was from a group of performers just starting on what I’m sure will be hugely successful careers in circus. 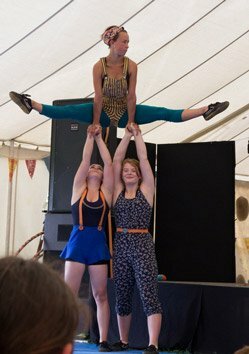 The Commonwealth Youth Circus (CYC) was put together by Bright Night International and after almost a year of training they performed their show throughout Scotland alongside the Queen’s baton relay in the run up to the Commonwealth Games. Composed of young people between the ages of 13 and 23 and with backgrounds in dance, gymnastics, parkour and circus, the CYC brought down two-thirds of the cast to Play. They were also missing the huge set they used on tour so put together a new show for Play in the days running up to their performance. Not that you could tell, their show was epic! They opened with a high energy ensemble piece featuring flips and acrobatics inside, around and through hula hoops. As the cast left the stage we were left with Shona and her hoops. Shona has some wonderfully entertaining facial expressions and some serious hoops skills to boot as she finished her piece with a five split. Each section of the show flowed together nicely and showed the young group’s maturity in thinking not only about the individual acts but how to make them into a coherent, single show. Following Shona were Will and Gabriel with an excellently timed poi piece that featured some good body movement, two elements that are often lacking in poi routines. Cathi and Cory performed some amazing feats of balance and flexibility in an acrobalance piece that verged on contortion at times. Iain was next up with, if memory serves, a dropless contact juggling act with some nice butterfly sequences and balances. Robbie, the youngest CYC member and parkour prodigy, joined Iain on stage for some acrobatic ball juggling. Laura mixed things up with an excellent dance and breakdance piece before Sam and Hannah took to the stage with a superb but quite serious hand balancing number. Alyssa joined Hannah for more acrobatics only this time the characterisation was fun and cute. There was another change in pace, prop and atmosphere as Will and David busted out some very nice club passing and take out patterns in a piece that finished with both performing tight five club cascades. The final act in the show bookended the performance perfectly with another high energy ensemble piece full of flips, twists and loads of balls. The guys and girls of the CYC have talent coming out of their pores. What’s more they’re down to earth and a whole load of fun; from tricking battles on the field to group dancing in the big top and several Renegade acts that definitely didn’t happen, the CYC were an great addition to Play and I hope they enjoyed the festival as much as we enjoyed them being part of it. Friday is a big show day at Play and following the CYC’s matinee later in the evening was the Fire Gala. This was a truly international affair with just one act from the UK. Opening up the show was Danielle Good from the USA. Poi acts are sometimes either too focussed on looking pretty with very few skills or full of tech but with little else. Danielle is one of a rare breed that can combine good movement, stage presence, costume and technical skills into a consummate poi performance. Act number two was possibly my favourite of the fire show. Simon Janson entered the stage in convict’s clothing after a preamble about how he’d lost the use of his hands in a Ugandan prison. Simon’s contact staff skills, especially the fingertip fishtails and angel roll patterns are surpassed only by his delightfully funny character and expressions. Next was a special moment for more than one reason. DeLighters, an Edinburgh based performance troupe, performed a four-person sparkle poi routine featuring Play director, Rob Thorburn. It was great to see Rob take to the stage at his (and Duncan’s) own event. Now, I think this nicely choreographed and well-timed act was probably created for the public but I’m not sure that lets Rob off the hook for performing a backbend buzzsaw, a move Rob himself has repeatedly described as “illegal”. I will not forget that moment, Rob, and it’ll be ribbing material for years to come! The international talent then returned to the stage in the unmistakable form of Exuro doing double staff. Exuro’s act featured loads of throws and some super sweet behind-the-back catches. Frenchie, who’s originally a Mancunian but now resides in New Zealand, then presented a fast-paced hoop act that had been written only a few hours before the show! Kyle Johnson was the third American to step onto the Fire Gala stage. Swinging two, then three torches, Kyle’s manipulation was tight and dynamic and is always a pleasure to watch. He finished his act by juggling five torches with composure and precision. Headlining the Fire Gala was Germany’s, Christian Unger. Entering the stage in a green and black costume, Christian’s character had a mischievous, gremlin-esque quality to it. Christian performed some of the smoothest, most confident and solid three poi fire spinning I’ve seen. Three poi superman, butterfly and other patterns were mixed with some poi juggling to a dark soundtrack. Christian left the stage to cries of “more” from the crowd. Luckily Christian was prepared and the stage blew up! Almost literally. Returning with burning coal fire poi, Christian made the crowd collectively wet its pants with excitement as he created explosions of coal dust by colliding the poi together or hitting them on the ground. 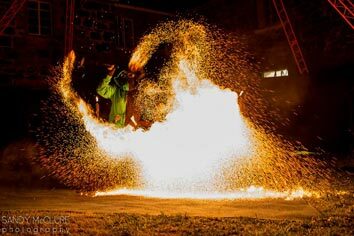 The coals create a great effect as they do “explode” but the tiny embers remain floating and dancing around the performer as they continue to spin the poi. 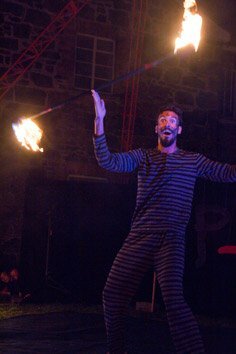 Christian’s act was a fantastic crescendo to an excellent fire show. Last but absolutely not least is the indoor Gala Show. Getting things going in style was David Trapps with a tumbling routine. David showed impressive flexibility as he edged down into front splits, twisted to side splits and, later in the act, got his head and shoulders between his legs. The act also included some back flicks, aerial cartwheels and some no-handed headstands. The acrobatics was followed by the extremely funny and entertaining, Robin Gunney. Robin mixed contemporary, classic and plain odd styles of juggling into his piece. He started with a slick club routine that featured many modern manipulation styles before moving on to ping pong ball juggling, tea bag and cup manipulation, which was a big crowd-pleaser, and a three-ball routine. Robin finished with a gentleman juggler style trick where he balanced a ball and stick on his head, had a small hoop rotating around his leg and then juggled balls at the same time. The pace dropped and the ambiance increased for the next act. Mark Steyn took to the stage with a beautiful contact juggling routine. Dressed in a black leather kilt, which has become his trademark, Mark mesmerised the audience with silky smooth hand, arm and body rolls. After a virtually flawless rendition of his routine Mark also absolutely nailed his final trick; the super-tough and much coveted finger balance, no mean feat with a huge, heavy acrylic. Finishing the first half of the show in style were Just Add Hoops, which consists of Anna Fisher and Meike Lizotte. Not only can these girls hula hoop, each splitting five hoops near the end of their routine, they also have some superb acrobatics and incredible flexibility which they integrate with their hooping. 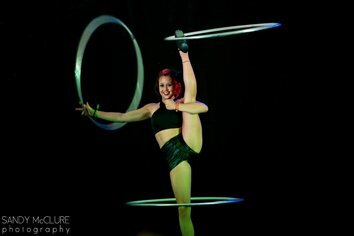 One of the highlights of their act involved throwing the hoop, kicking up into a handstand and catching their hoops between the back of their necks and one of their legs. Jaw-dropping stuff. The second half of the show started with Tom Grinyer, this time performing a poi act. By coincidence there was a joker card on the stage as Tom entered. This had been dropped by the compere instead of being placed there by cheeky Americans, as Tom thought. To protect his dignity (don’t ask otherwise you’ll be playing this game too) Tom was forced to perform the entire routine with a joker card in his mouth. There was more to Tom’s act than weird games though. Starting with a single poi section that includes a classy blind catch, Tom moved on to some techy two poi manipulation before finishing the routine with a three poi juggling section. Stepping in for Kyle Johnson, who was unwell, was some guy with a tatty looking staff and bodged together costume. There wasn’t much to his act except a “ting” and cheesy grin - that bit was quite good. There was quite a cool cartwheel move at the end of the act but it didn’t really work. We missed you, Kyle. After that brief blip, Gail O’Brien returned the Gala to the standard we were expecting. Gail’s new hoop routine is, in her own words, “ambitious”, not that you could tell from the composure with which she performs it. You can tell from the ridiculousness of the moves she performs, though, tricks like brand new and beautiful balance techniques, smooth and controlled backside to frontside body rolls, blind catches and much more. Gail changes the pace of her hooping to great effect and puts so much feeling into her routines it’s hard not to well up. That left us with just one more act, and it was another tear-jerker. 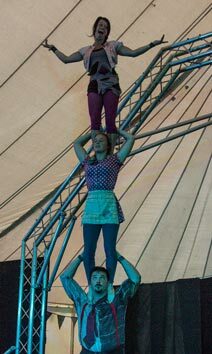 Massimiliano and Roisin from LIT circus presented an emotionally charged and romantic acro routine. The pair mixed intense moves where Roisin was thrown, flipped, twisted and balanced on, off, over and around Massi with equally intense embraces and longing stares from across the stage. This routine was an education in how to create a truly great act. Formidable strength, flexibility and technique were blended with narrative and physical theatre to tell a love story. This is circus at its best. All that remained to do was dance the night away and definitely not watch the Renegade that definitely didn’t happen before the sad task of packing up and heading home. Every year I wonder how it’s possible to have a better five days and somehow the following year seems to top the previous. Play is a truly beautiful event run and attended by beautiful people. If you think that sounds like the over-sentimental ramblings of circus freak then you probably haven’t been to Play. Keep up to date with Play info by checking our news section regularly, joining the Play Facebook group and checking out their website. Photos reproduced by kind permission of Sandy McClure of Love in Focus and Chaka September.